Growth rate and mature size A fine selection of pyramidal to upright round form. It will grow to a height of 60 ft and a width of 45 ft.
Foliage Leaves are opposite and pinnatley compound, 8 to 15” long, with 5 to 9 leaflets, stalked, 2 to 6” and 1 to 3” wide. 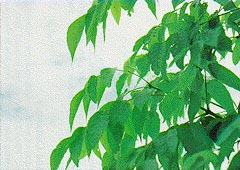 Body is ovate-lanceolatle, with acute to acuminate at apex. Usually the margin is remotely serrated. Summer color is dark green and glabrous on the surface with a pale green under the leaf surface. 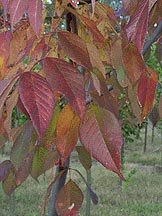 The fall color is a reddish purple that normally lasts 2 to 4 weeks. Flowers This tree is dioecious or possibly polygamo-dioecious. Both sexes appear in a panicle before the leaves emerge. The corolla absent, with the color being green to purple and blooming in April. Fruit A 1 to 2” long samara with it’s width about 1/4”. No ornamental color or quality to the fruit. Bark Gray-brown bark is very smooth in youth, but becoming very deeply furrowed and ridged in just a few short years, with the ridges interlacing to form a diamondback pattern of 2″ thick bark at maturity. Insects and diseases This tree can have many problems if poorly cared for. It is susceptible to: Cankers, Lilac/ash borer, carpenter worms, and ash flower gall. Recently, the ash sawfly has become a big problem on Autumn purple ash up and down the Front Range of Colorado, chewing leaves in May and June. Ash borer is a big problem in Colorado where ash trees grow. 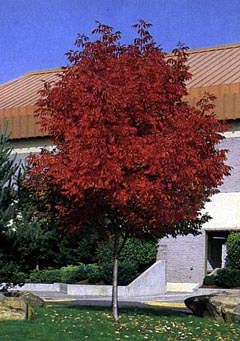 Landscape value Autumn purple ash is best suited for medium-sized spaces or large spaces, like a park. A small space is not recommended as this can stress the tree and cause a poor-developing root system. Also, it would not be a good tree to set under power lines, as it will grow to a height of 60ft.